It has been a myth that best quality often comes at a price, but it has been not true about the most talked about printer from 3D Systems, The ProJet 1200. The printer has been open for business and is small than a coffee maker so that it can be kept anywhere and is easy to handle. The printer was declared open for business on 24th March 2014 and the company officially started shipping the machines. 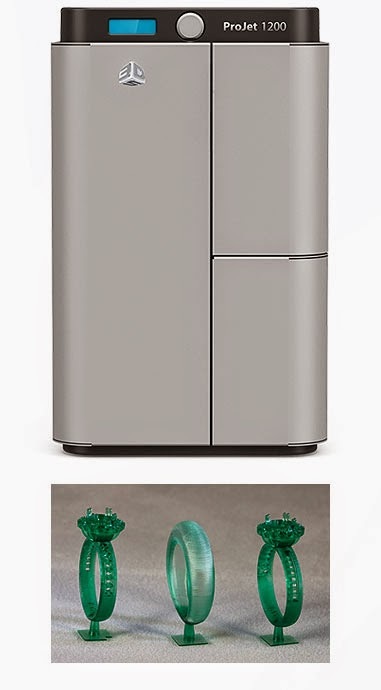 The printer works on the Stereolithography Technology that can provide accurate and perfect designs in a very less time and is the most accurate technology recently for the rapid prototyping technology. Projet 1200 can print numerous things and can be used in various applications across the globe. The dental industry can print crowns, bridges and castable patterns in all shapes and sizes in a very less time. It can be used in designing industry for making casting patterns and complex jewelry pieces. ProJet 1200 are used by different hobbyists for making many different and creative designs. Miniatures, phone cases, selfies, accessories, car parts, tiny toys, pendants, tiny artifacts, knobs, game pieces and housing pieces can be made. The size is not the matter with ProJet and is the most affordable option for 3D printing. The Stereolithography technology is known for its fine and accurate details and are designed and printed with very less time. Options like color printing, pad printing and texturing can be done with the help of ProJet and a step by step process is given to ensure the timely delivery of products. ProJet has been used today in many applications and the printer can print parts faster than baking a cake. This is the most economic and safe printer which can be operated by anyone and everyone.